One of the most effective ways of problem solving is cause and effect analysis in a graphic method - cause and effect diagram. Here is easy but powerful software for drawing cause and effect diagram. Edraw contains powerful tools for problem solving with fishbone diagram graphic method. Fishbone diagram can be grouped into major categories to identify sources of variation causes. Fishbone diagram shows factors of Equipment, Process, People, Materials, Environment and Management, all affecting the overall problem in one drawing for the further analysis. Typically, a cause and effect diagram is composed of problem (effect), spine, category, primary cause and secondly cause. These elements are illustrated like fishbone and thus called fishbone diagram. Below is a detailed guide about Edraw fishbone diagram. Click the picture to download it. 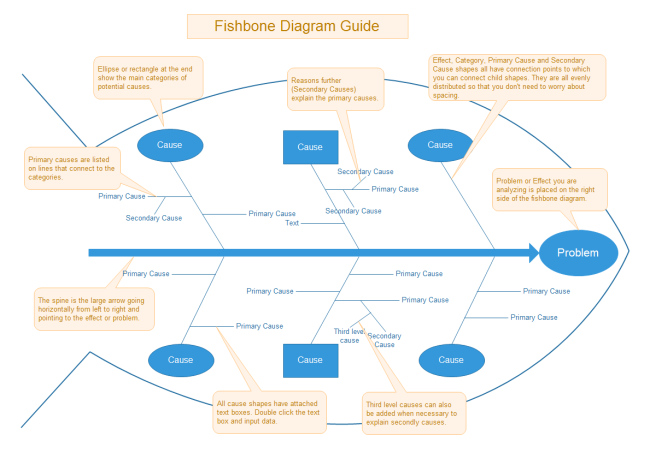 From the template, we can see that fishbone diagram can help analyzers find out as many causes as possible. And it clearly displays the logical relationship between cause and sub cause until the root cause is found out. Generally, eliminating the root cause is often the solution for a problem. Edraw Fishbone diagram solution is vector graphics and diagramming software with the ability to solve problems using the cause-and-effect diagrams. With Edraw, you can gain more visual tools to aid problem solving like reframing matrix, radar chart and mind map. 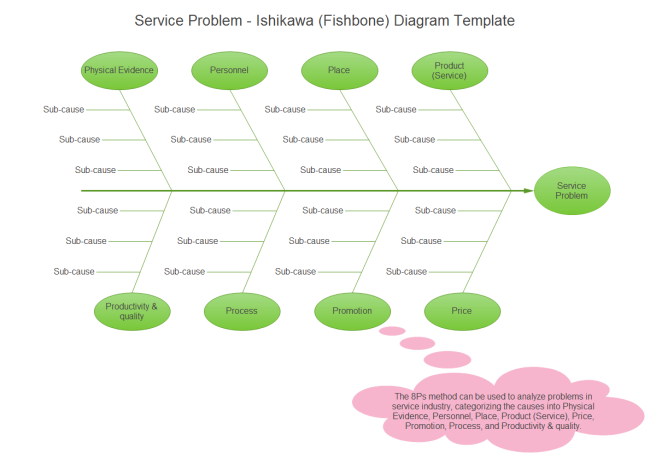 Use Edraw enhanced with Fishbone diagram solution to draw your own Ishikawa diagrams for problem solving, in only a few minutes.